CIO & Smart Grid Master: iPhone 3G: Still Not Ready for the Enterprise! iPhone 3G: Still Not Ready for the Enterprise! "Many colleagues and peers across the land continue to debate if we should support the iPhone at work. First of all, let me emphasize that the iPhone is a great device with incredible technology integration and beautiful design. However, the product has some serious short comings when it comes to Enterprise users and requirements. Here are the few important things that Apple has to resolve to get an iPhone that can not only be supported by IT but endorsed by IT. Apple knows all these requirements and has been working on several others since the device came out last year. We look forward to version 2." When it comes to employees' smartphones, IT managers may seem like the worst kind of control demons. And for good reason -- nothing is as easily lost or stolen (which could be use to hack the corporation) as a smartphone, along with its corporate data. RIM introduced device management software, BlackBerry Enterprise Server (BES), at the same time it launched the device itself back in 1999. Today BES, lets IT managers enforce more than 200 security and other IT policies, as well as create their own. 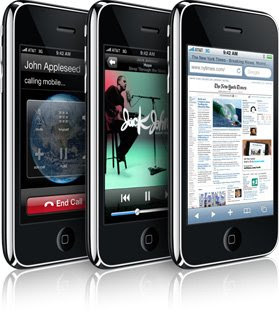 The iPhone 3G uses the same ActiveSync technology in Exchange 2007 SP1, which only supports 45 policies vs. the 200 policies supported by the Blackberry Enterprise Server. Hence, the iPhone and ActiveSync combo is not secure or practical. Why? Because many ActiveSync features are missing. Those features include the ability to limit users from downloading some or all third-party software, the ability to turn off expensive international data roaming, and the ability to natively encrypt data on the iPhone or its storage card. The lack of built-in management features is in contrast with the iPhone's many built-in consumer features, such as its 2-megapixel camera, its music and video player and fast Web browser. These all create more potential security and compliance problems and ways for the device to be misused. Having to send the entire device back for service due to battery issues is just not practical. And having to only work with AT&T is also not practical. The iPhone 3G software is a great progress over the older version. However, there are still four major challenges to over come. Maybe version 3 will remove 1 and 2, while the battery issue is a hardware problem that will require re-design, and the one carrier support is a business issues that can be fixed when the AT&T agreement expires.